I usually go to Thai House Express on Larkin when I'm in the mood for some good red curry with duck and other Thai standbys. For some reason the Thai House Express on Castro has never won me over. The food is o.k. but, not as good as the one on Larkin or the Thai Chef nearby. This time I gave the Kao Ka Moo "special pork leg stew over rice" a try. 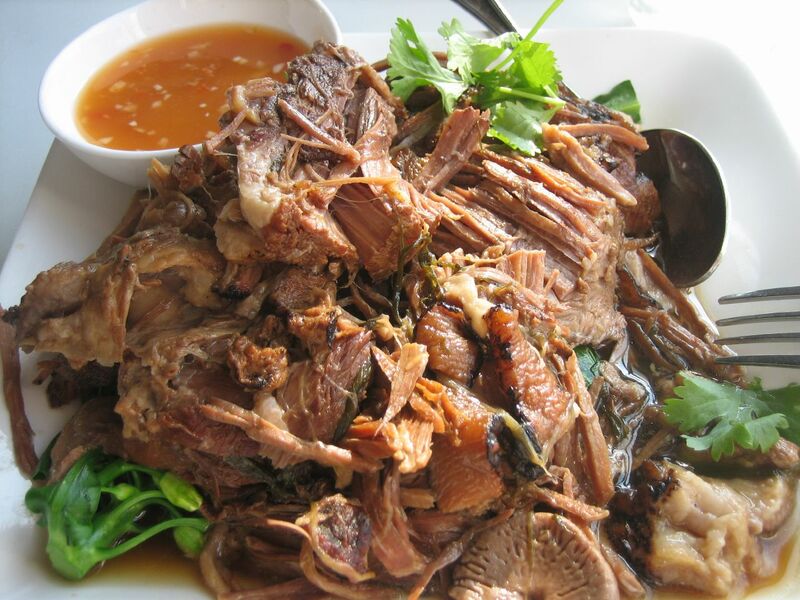 The server described it as a Chinese style braised dish. Hmm. As I learned from Kasma, there are several dishes served in Thailand that Chinese immigrants brought to the country. Out came a mouth watering mound of juicy pork fall off your fork tender and flavored with the five spice anise soy sauce base. One taste and I realized it was the familiar base used in Chinese "lu-roe" and "hong sao ro." This one was good, though the five spice was not as strong as I've had at Chinese places. And there was a fish sauce based dipping sauce which had a nice sour flavor to contrast with the buttery pork. Something I'll look forward to ordering again.